For 2010, the Hyundai Santa Fe crossover gets a mild redesign inside and out, along with a couple new engines and a new transmission. The new engines include a 2.4-liter four-cylinder that replaces the outgoing 2.7-liter mill. An improved 3.5-liter powerplant takes over the old and busted 3.3-liter V6. Both engines offer more power and better fuel efficiency than the outgoing engines, as one would expect, and are mated to a six-speed auto or manual transmission. A few minor touch-ups on the outside include different wheels, tail lights and fog lights, along with new bumper fascias, bodyside moldings, and a color-matching grill. Nothing major out here, just enough to keep it fresh and allow Santa Fe enthusiasts (is there such a thing?) to bore others to death with their in-depth crossover SUV knowledge. Inside, Hyundai adds an “Eco” indicator standard all all automatic transmissions, touch-screen navigation, a couple safety bits, standard bluetooth and steering wheel audio controls, and new seating surfaces. Again, nothing major here, but if it’s enough to attract a few new buyers then Hyundai’s done their job. 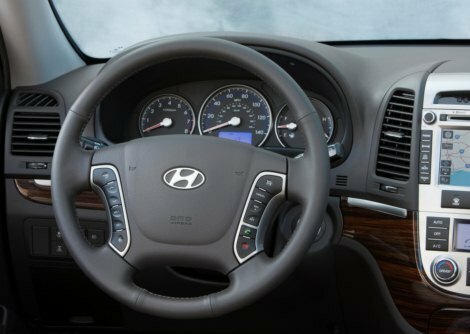 When we reviewed the 2008 Hyundai Santa Fe, we were particularly impressed with how friendly and pleasant it was to drive without feeling too big or top-heavy. What we didn’t like were the cheap-feeling interior materials, and Hyundai seems to have (At least partially) corrected that in the new model. 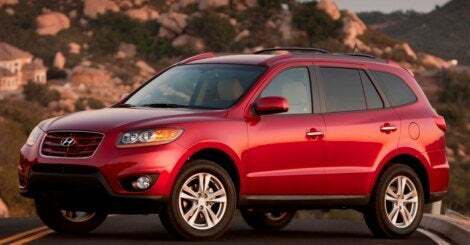 No Comments on "2010 Hyundai Santa Fe Gets Refreshed, Two New Engines"